Philippines–United States relations (Filipino: Ugnayang Pilipinas – Estados Unidos) are bilateral relations between the Republic of the Philippines and the United States of America. The relationship between the United States and the Philippines has historically been strong and has been described as a Special Relationship. The current Philippine president Rodrigo Duterte, however, is supportive of a foreign policy that is less dependent on the United States, favoring one that prioritizes closer relations with China instead. The Philippines is one of the oldest Asian partners of the U.S. and a strategically major non-NATO ally. The United States was consistently ranked as one of the Philippines' favorite nations in the world, with 90% of Filipinos viewing the U.S. and 91% viewing Americans favorably in 2002, 90% of Filipinos viewing U.S. influence positively in 2011, 85% of Filipinos viewing the U.S. and Americans favorably in 2013, and 92% of Filipinos viewing the U.S. favorably in 2015, and 94% having confidence in former United States president Barack Obama, making the Philippines the most pro-American country in the world. This article discusses Philippine–American relations after Philippine independence from the United States in 1946, while the article History of the Philippines (1898–1946) describes the history of the Philippines during American colonial rule. The US Embassy in Manila. The Philippine Embassy in Washington, D.C..
President Elpidio Quirino with Harry S. Truman at the White House, 1951. A 1947 Military Bases Agreement gave the United States a 99-year lease on a number of Philippine military and naval bases in which U.S. authorities had virtual territorial rights. 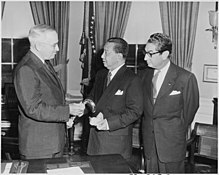 In August 1951, a mutual defense treaty (MDT) was signed between representatives of the Philippines and the United States. The overall accord contained eight articles and dictated that both nations would support each other if either the Philippines or the United States were to be attacked by an external party. An amendment to the bases agreement in 1966 reduced its 99-year term to 25 years. In 1979, after two years of negotiation, the bases agreement was renewed with some amendments. Pursuant to the bases agreement, the United States maintained and operated major facilities at Clark Air Base until November 1991, and at Subic Bay Naval Complex and several small subsidiary installations in the Philippines until November 1992. In July 1991, negotiators from the two countries reached agreement on a draft treaty providing for the clean-up and turn over of Clark to the Philippine government in 1992, and for the lease of Subic Bay Naval Base by the U.S. for ten years. By 1991, operations at Clark had already been scaled back because of the end of the Cold War, with the last combat aircraft leaving in 1990, before the base was heavily damaged by the 1991 eruption of Mount Pinatubo. The post-U.S. bases era has seen U.S.-Philippine relations improved and broadened, with a prominent focus on economic and commercial ties while maintaining the importance of the security dimension. U.S. investment continues to play an important role in the Philippine economy, while a strong security relationship rests on the Mutual Defense Treaty of 1951. In February 1998, U.S. and Philippine negotiators concluded the Visiting Forces Agreement (VFA), paving the way for increased military cooperation under the MDT. The agreement was approved by the Philippine Senate in May 1999 and entered into force on June 1, 1999. Under the VFA, the U.S. has conducted ship visits to Philippine ports and has resumed large combined military exercises with Philippine forces. Key events in the bilateral relationship include the July 4, 1996 declaration by President Ramos of Philippine-American Friendship Day in commemoration of the 50th anniversary of Philippine independence. Ramos visited the U.S. in April 1998, and then-President Estrada visited in July 2000. President Arroyo met with President Bush in an official working visit in November 2001 and made a state visit in Washington on May 19, 2003. President Bush made a state visit to the Philippines on October 18, 2003, during which he addressed a joint session of the Philippine Congress—the first American President to do so since Dwight D. Eisenhower. There are regular U.S. cabinet-level and congressional visits to the Philippines as well. President Arroyo repeatedly stressed the close friendship between the Philippines and the U.S. and her desire to expand bilateral ties further. Both governments tried to revitalize and strengthen their partnership by working toward greater security, prosperity, and service to Filipinos and Americans alike. Inaugurated into office on the same day as President Bush, President Arroyo lent strong support to the Global War on Terrorism. In October 2003, the U.S. designated the Philippines as a Major non-NATO ally. That same month, the Philippines joined the select group of countries to have ratified all 12 UN counterterrorism conventions. The annual Balikatan (Shoulder-to-Shoulder) bilateral military exercises contribute directly to the Philippine armed forces' efforts to root out Abu Sayyaf and Jemaah Islamiyah terrorists and bring development to formerly terrorist-plagued areas, notably Basilan and Jolo. They include not only combined military training but also civil-military affairs and humanitarian projects. The International Military Education and Training (IMET) program is the largest in the Pacific and the third-largest in the world, and a Mutual Logistics Support Agreement (MLSA) was signed in November 2002. Similarly, law enforcement cooperation has reached new levels: U.S. and Philippine agencies have cooperated to bring charges against numerous terrorists, to implement the countries' extradition treaty, and to train thousands of Filipino law enforcement officers. There is a Senior Law Enforcement Advisor helping the Philippine National Police with its Transformation Program. The U.S. works closely with the Philippines to reduce poverty and increase prosperity. The U.S. fully supports Philippine efforts to root out corruption, to open economic opportunity, and to invest in health and education. USAID programs support the 'Philippines' war on poverty as well as the government's reform agenda in critical areas, including anti-money laundering, rule of law, tax collection, and trade and investment. Other USAID programs have bolstered the government's efforts to heal divisions in Philippine society through a focus on conflict resolution, livelihood enhancement for former combatants, and economic development in Mindanao and the Autonomous Region in Muslim Mindanao, among the poorest areas in the country. Meanwhile, important programs continue in modern family planning, infectious disease control, environmental protection, rural electrification, and provision of basic services—as well as PL 480 food aid programs and others, which together totaled $211.3 million. In 2006, the Millennium Challenge Corporation granted $21 million to the Philippines for a threshold program addressing corruption in revenue administration. Nearly 400,000 Americans visit the Philippines each year. Providing government services to U.S. and other citizens, therefore, constitutes an important aspect of the bilateral relationship. Those services include veterans' affairs, social security, and consular operations. Benefits to Filipinos from the U.S. Department of Veterans Affairs and the Social Security Administration totaled $297,389,415 in 2006. Many people-to-people programs exist between the U.S. and the Philippines, including Fulbright, International Visitors, and Aquino Fellowship exchange programs, as well as the U.S. Peace Corps. The Agreement on Enhanced Defense Cooperation is a ten-page document containing a preamble and 12 articles, that was signed on April 28, 2014. It is a framework agreement that raises the scope of the 1951 MDT. Importantly, the Preamble notes that both parties “share an understanding for the United States not to establish a permanent military presence or base in the territory of the Philippines.” The Preamble later concludes, “all United States access to and use of facilities and areas will be at the invitation of the Philippines and with full respect for the Philippines Constitution and Philippine laws. 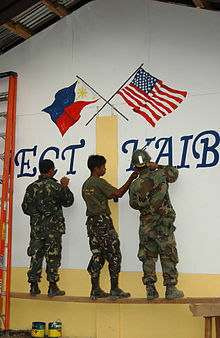 Filipino soldiers painting a US and Philippine flag. Two-way U.S. merchandise trade with the Philippines amounted to $17.3 billion in 2006 (U.S. Department of Commerce data). According to Philippine Government data, 16% of the Philippines' imports in 2006 came from the U.S., and about 18% of its exports were bound for America. The Philippines ranks as the 26th-largest export market and the 30th-largest supplier of the United States. Key exports to the U.S. are semiconductor devices and computer peripherals, automobile parts, electric machinery, textiles and garments, wheat and animal feeds, and coconut oil. In addition to other goods, the Philippines imports raw and semi-processed materials for the manufacture of semiconductors, electronics and electrical machinery, transport equipment, and cereals and cereal preparations. The U.S. traditionally has been the Philippines' largest foreign investor, with about $6.6 billion in estimated investment as of end-2005 (U.S. Department of Commerce data). Since the late 1980s, the Philippines has committed itself to reforms that encourage foreign investment as a basis for economic development, subject to certain guidelines and restrictions in specified areas. Under President Ramos, the Philippines expanded reforms, opening the power generation and telecommunications sectors to foreign investment, as well as securing ratification of the Uruguay Round agreement and membership in the World Trade Organization. As noted earlier, President Arroyo's administration has generally continued such reforms despite opposition from vested interests and "nationalist" blocs. A major obstacle has been and will continue to be constitutional restrictions on, among others, foreign ownership of land and public utilities, which limits maximum ownership to 40%. During the visit by President Benigno Aquino III to Washington DC, on July 7, 2012, the US-Philippine Society was launched. It is a non-profit independent organisation tasked for generating awareness about the Philippines in the US. The last board meeting was conducted by the society on January 24, 2013. In its 2013 Special 301 Report, the Office of the United States Trade Representatives wrote "The United States looks to the Philippines to take important steps to address piracy over the internet, in particular with respect to notorious online markets". It is speculated that pressure from the United States contributed to the complaint filed by Philippine Association of the Record Industry against the torrent website KickassTorrents, resulting in its seizure by Philippine authorities on June 13, 2013. The 1951 mutual-defense treaty was reaffirmed with the November 2011 Manila Declaration. United States Chief of Naval Operations Admiral Jonathan Greenert suggested that LCS or surveillance aircraft may be deployed to the Philippines. And the Philippines is considering the proposal. These "rotational deployments" will help replace some of the American presence in the area that was given up when the permanent American bases in the Philippines were closed under President Bush. In 2012 the Philippines and the United States conducted joint military exercises. As of 2012, a U.S. military contingent of 600, including Navy Seals and Seabees are stationed "indefinitely" in the Southern Philippines, in a declared non-combatant role to assist the Armed Forces of the Philippines in operations against the al-Quaida-linked Abu Sayyaf terrorist group primarily on the island of Basilan in western Mindanao and the Sulu islands, in particular Jolo, a long-time stronghold of Abu Sayyaf. In April 2014, a ten-year pact (EDCA – Enhanced Defence Co-operation Agreement) was signed between the U.S. President, Barack Obama and the Philippine President, Benigno Aquino III, allowing United States to increase military presence in the Philippines. The Joint US Military Assistance Group (JUSMAG) handed over weapons to the Philippine Marine Corps.The equipment includes 300 M4 carbines, 200 Glock 21 pistols, 4 M134D Gatling-style machine guns, and 100 M203 grenade launchers, the US embassy in Manila said in a 5 June statement. The JUSMAG also delivered 25 new Combat Rubber Raiding Craft with outboard motors to PMC headquarters in Taguig, where PMC commandant Major General Emmanuel Salamat formally accepted delivery of the weapons during a transfer ceremony on 5 June.The equipment was delivered amidst the Marawi Crisis. In February 2019, US state secretary Pompeo affirmed US commitments under the 1951 Mutual Defense Treaty (MDT) during a meeting with counterparts in the Philippines. Pompeo in a speech added, "as the South China Sea is part of the Pacific, any armed attack on Philippine forces, aircraft or public vessels will trigger mutual defense obligations". The US assured that they will "back the Philippines" if confrontation between the Philippines and China occurs in the South China Sea. The move came after years of American reluctance to affirm commitments, which led to numerous Filipino politicians to push for review of the 68-year-old security pact between the Philippines and the US. The Filipino foreign affairs secretary welcomed the US committment, adding that there is "no need to review" the pact anymore. The U.S. maintains an embassy in Manila and a consulate in Cebu. The American Business Center, which houses the Foreign Commercial Service and the Foreign Agricultural Service, is located in Makati City. 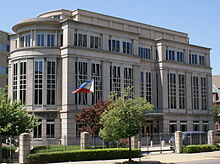 The Philippine government maintains an embassy in Washington, D.C. as well as several consulates throughout the United States. After President Rodrigo Duterte formally assumed the office on June 30, 2016, the US-Philippine relations began to sour. The drift between the Duterte and Obama relationship began when the U.S. President expressed his concern over human rights issues on President Duterte's “War on Criminality and Drugs”. According to a statement issued by the White House, Obama commended the country for its "vibrant democracy." But he also highlighted "enduring values" that underpinned their "longstanding ties," including "shared commitments to democracy, human rights and rule of law." This intervention and President Duterte's choice of words while speaking about President Obama during a press conference, where he infamously called him “a son of a whore” resulted in a canceled meeting between the two leaders during the 2016 ASEAN summit held in Laos. A few weeks after, Duterte suggested American special forces to cease its operations and leave Mindanao. He cited the killings of Muslim Filipinos during a U.S. pacification campaign in the early 1900s, which he said were at the root of the long restiveness by minority Muslims in the largely Catholic nation's south. It was only during his official visit to Vietnam last September 28, 2016 when he explicitly expressed that he wants an end to the Philippines' joint military exercises with the United States, saying the upcoming scheduled war games will be the last under his term, while adding that he will continue to uphold the Philippines' treaties with the US. As of October 2016[update], despite Duterte's shift of foreign policy to China from US, Filipinos still had low approval and trust rate in China compared to the US which continued to hold high trust and approval ratings. On former president's Fidel Ramos' resignation as special envoy to China, he stated that he didn't like Duterte's treatment of US President Obama. Duterte later said following the 2016 U.S. Presidential Election that he will stop quarrels with the US following President Donald Trump's victory. Trump has planned to continue to aid the country during his Presidency. ^ "US-Philippines: The End of a Special Relationship". The World Today. 31. ^ "Duterte aligns Philippines with China, says U.S. has lost". reuters.com. Retrieved October 18, 2016. ^ Santos, Matikas (April 22, 2014). "85% of Filipinos love US – survey". Philippine Daily Inquirer. Philippines. Retrieved May 13, 2015. ^ "Opinion of the United States". Global Attitudes & Trends. Pew Research Center. 2015. Retrieved August 15, 2017. ^ "Confidence in the U.S. President". Global Attitudes & Trends. Pew Research Center. 2015. Retrieved August 15, 2017. Subramanian, Courtney (July 19, 2013). "Pakistan Is No Fan of the U.S., But the Philippines Still Likes Us". Time. United States. Retrieved May 13, 2015. ^ "Agreement between the United States of America and the Republic of the Philippines Concerning Military Bases" (PDF). United States Library of Congress. March 14, 1947. ^ "Philippines : The Early Republic". britannica.com. Retrieved December 16, 2017. ^ a b "PHILIPPINE SENATE VOTES TO REJECT U.S. BASE RENEWAL". The New York Times. September 16, 1991. ^ Rodriguez, Dylan (2010). Suspended Apocalypse: White Supremacy, Genocide, and the Filipino Condition. U of Minnesota Press. p. 892. ISBN 978-0-8166-5349-2. ^ Broder, John M. (July 18, 1991). "U.S. Reaches Accord With Manila, Will Leave Clark Air Base : Philippines: Volcano causes abandonment of field. But Americans will keep Subic Naval Base for 10 years". Los Angeles Times. Retrieved March 12, 2011. ^ "Reopening of US naval base in PH could fuel South China Sea". investvine.com. Retrieved November 14, 2015. ^ "Document: Enhanced Defense Cooperation Agreement between the Philippines and the United States | GOVPH". Official Gazette of the Republic of the Philippines. Retrieved September 28, 2016. ^ "Top US firms meet to analyse Philippines". Investvine.com. March 1, 2013. Retrieved March 5, 2013. ^ 2013 Special 301 Report, Office of the United States Trade Representative. ^ "KickassTorrents Domain Seized After Music Industry Complaint - TorrentFreak". June 14, 2013. ^ "U.S. Pledges Help For Philippine Navy" AFP, January 27, 2011. ^ "Clinton on Manila Declaration". Embassy of the United States, Manila. ^ Clinton On Manila Declaration, Voice of America, November 30, 2011. ^ "U.S. Navy may station ships in Singapore, Philippines." Reuters, December 16, 2011. ^ "PHL studying US offer to deploy spy planes — Gazmin." GMA Network, January 27, 2012. ^ Weisgerber, Marcus. "U.S. Will Lean on Technology As Asia-Pacific Pivot Continues: Panetta." Defense News, May 10, 2012. ^ Whaley, Floyd (April 29, 2012). "Philippines Role May Grow as U.S. Adjusts Asia Strategy". The New York Times. ^ Vaughn, Bruce (November 1, 2010). "Terrorism in Southeast Asia". DIANE Publishing – via Google Books. ^ US troops can use Clark, Subic bases, Philippine Star, June 6, 2012. ^ "Welcome more US troops–Del Rosario. ", Philippine Daily Inquirer, April 14, 2013. ^ Keck, Zachary (March 14, 2014). "US-Philippines Reach Deal on US Military Access". thediplomat.com. The Diplomat. Retrieved March 14, 2014. ^ Pike, John. "Carter: U.S., Philippines Enjoy 'Longstanding' Alliance". ^ Dizon, Nikko (April 13, 2014). "Defense accord with US a 'security cover' for PH". The Philippine Inquirer. Retrieved April 30, 2014. ^ "FACT SHEET: United States-Philippines Bilateral Relations". Press release – White House. Office of the Press Secretary. Retrieved April 30, 2014. ^ Lowe, Aya (April 27, 2014). "Military bases at centre of Philippines-US relationship". The National. Retrieved April 30, 2014. ^ Sison, Jose (April 28, 2014). "US and Philippines: How strategic is the partnership?". Al Jazeera. Retrieved April 30, 2014. ^ Freeman, Colin (April 27, 2014). "Philippines to sign security pact with US". The Telegraph. Retrieved April 30, 2014. ^ "US delivers M4 carbines, M203 grenade launchers to Philippines for counter-terrorism operations | Jane's 360". www.janes.com. Retrieved June 6, 2017. ^ "Readout of the President's Call with President-elect Rodrigo Duterte of the Philippines". May 17, 2016. Retrieved September 28, 2016. ^ Gayle, Damien (September 5, 2016). "Barack Obama cancels meeting after Philippines president calls him 'son of a whore'". The Guardian. ISSN 0261-3077. Retrieved September 28, 2016. ^ "Duterte Wants Us Forces Out Of Southern Philippines". September 13, 2016. Retrieved September 28, 2016. ^ "TO APPEASE CHINA: Duterte announces end to military exercises with US". Retrieved September 28, 2016. Cullather, Nick (1994). Illusions of influence: the political economy of United States-Philippines relations, 1942–1960. Stanford University Press. ISBN 0-8047-2280-3. 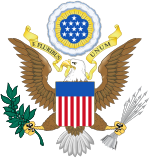 Wikimedia Commons has media related to Relations of the Philippines and the United States. History recognition, diplomatic and consular relations : Philippines, Office of the Historian, U.S. Department of State.